Choosing the right type of stair lift or lifting device is a very important decision, which should be based on the needs of the senior and the specifics of the home, as well as the budget of the senior. With the many different stair lift manufacturers and suppliers of home medical equipment, this can often seem a little overwhelming, especially if you make the mistake of calling up a stair lift seller, without having an idea of what you want and need, as the home medical industry is filled with high pressure salesman who are good at their job. However, if you arm yourself with some knowledge before contacting a salesman, you will be able to see through their pitch, while getting the best price and type of equipment that will fit your needs. So, as a caregiver, if you are considering purchasing a stair lift for a loved one, such as for your parents or grandparents, it is important to carefully evaluate this decision. When a loved one is hurting or having difficulty with something, it can be easy to rush blindly in and try to help them. This is natural, but is not always in the best interest of the one you are trying to protect. This is especially true of stair lifts and other home lifting devices, because it is important to ensure that it is the best choice to fit the senior’s needs. Understanding the needs of the senior begins with evaluating their abilities and medical conditions without bias. It is very important to determine if they should even be using the staircase in the first place and whether they will be able to realistically control the stair lift on their own. Much of this comes down to their cognitive abilities, but their vision and motor skills are also an important consideration. To use a stair lift, the senior will need to be able to safely sit and stand on their own, as most stair lifts usually use a chair design, as well as being able to use a simple hand control. The buttons on the hand control are easy to use and are often simply an up and down switch. 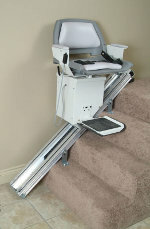 If you at all feel that they may not be able to use a stair lift safely or if they can still live a comfortable life without having to use the stairs, such as by living in a ground floor room, than a stair lift might not be necessary or it may be better to use a platform lift or residential elevator. Similarly, if the senior requires a wheelchair to get around, a traditional stair lift will not work. When choosing a lifting aid for your home, it is very important to make sure it will work with your home and to choose the best one for your living environment. For indoor staircases, a stair lift can often be easily installed, especially on straight staircases. One of the main advantages of the stair lift is that the staircase can still be easily used, as the stair lift does not usually take up more than 25% of the space on the stairs. For straight staircases, a number of do it yourself stair lift kits are available. The DIY Stair Lift Kit is designed to be easily installed by the homeowner, which can save a great deal of money on installation costs. For non-straight staircases, the DIY Stair Lift Kit is not always an option. However, this is more of a problem with staircases that have a circular curve, as there are a number of options available for staircases that are straight and have a landing, as well as staircases that are shaped like an “L.” For a truly curved staircase, it is usually a better choice to install an elevator, as a true curved stair lift is quite expensive and can take months to be built and installed. Those that have a more narrower staircase might want to use a perch lift or standing stair lift. Perch lifts provide a small platform for the user to stand on as the stair lift moves up the staircase. They are not as safe as sitting stair lifts, because the senior must remain standing as the lift moves, but perch lifts take up less room on the stairway and are also often used by those who are unable to safely sit. For wheelchair users, a platform stair lift is an option, but it is important to note that these tend to take up more space on the stairs and are often too wide for a standard residential staircase, so for non-commercial staircases, a residential elevator often ends up being a better choice. For outdoor staircases, both vertical platform lifts and stair lifts can often be used interchangeably, but in the case of stair lifts, it is essential to get one that is rated for outdoor use. Many find that vertical platform lifts, which are often called wheelchair lifts or porch lifts, provide the best value, because they are basically a self contained elevator that is installed next to the outdoor staircase. 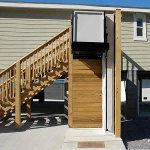 As a result, the porch lift can make bringing groceries into the home much easier and can also be used to transport two people at once, as well as allowing mobility scooters and wheelchairs to be moved up the stairs. When choosing a stair lift or other home lifting aid, it is also very important to consider the cost and do some price shopping. Most companies that sell stair lifts and other aids online are not actually the manufacturer, but are instead simply distributors, so by spending some time shopping around, you will be able to save a great deal of money and still get the exact same stair lift. With that said, DIY Stair Lifts are usually the least expensive option. For non-straight staircases that have a landing in them or are shaped like an “L” there are also several Do It Yourself stair lift kits that are less expensive. The main way these types of stair lifts save you money is that they are designed so that you can do the installation yourself. If you like, you can check out our AmeriGlide Stair Lift Installation Guide to see what is involved, but it is fairly simple to do, especially for someone who is mechanically inclined. For straight staircases, a DIY Stairlift Kit is usually the best choice, so if the stair lift distributor requires you to use their installation service, you would want to spend some time carefully considering their offer. However, for curved stair lifts and platform stair lifts, a professional installation is often required. It is important to make the distinction between outdoor vertical platform lifts and platform stair lifts though, as vertical platform lifts are relatively easy to install. Residential Elevators, curved stair lifts, and platform stair lifts are the most expensive options. However, residential elevators add value to a home and can be resold, as can platform stair lifts. Curved stair lifts, on the other hand, have a low resale value, because the track will only work on an identical staircase and the track is the most expensive part of a curved stair lift.